Thermoseal’s patent-pending ClearCool® 3200/3300 sliding door systems combine thermally-efficient, low-conductivity PVC extrusion profiles and our state-of-the-art insulating glass (IG) units manufactured with warm-edge SuperSpacer® technology. The SuperSpacer foam spacer system outperforms metal spacer systems, which provides dramatically-lower edge-of-glass condensation via warmer edge temperatures. Thermoseal’s SuperSpacer® is a warm-edge spacer system comprised of EPDM foam impregnated with desiccant, a mylar moisture vapor barrier, and high-strength acrylic adhesive to form an excellent edge-of-glass spacer system. The SuperSpacer EPDM foam construction allows the desiccant-embedded EPDM foam spacer to work quickly to adsorb moisture inside the airspace, which provides for some of the lowest dew points and frost points in the industry. In addition, the SuperSpacer® IG units provide a multi-layer vapor barrier and high-performance secondary sealant to keep moisture out and inert gas in. The visible surface of the spacer system is smooth and guaranteed against blistering and bubbling. The ClearCool® 3200/3300 sliding door systems are designed for long-lasting durability. The corners have welded miter joints which are stronger than the underlying extrusions, and which require no mechanical fasteners to assemble the doors, so installation is quick and easy, and there are fasteners to loosen and allow open miter joints to occur. 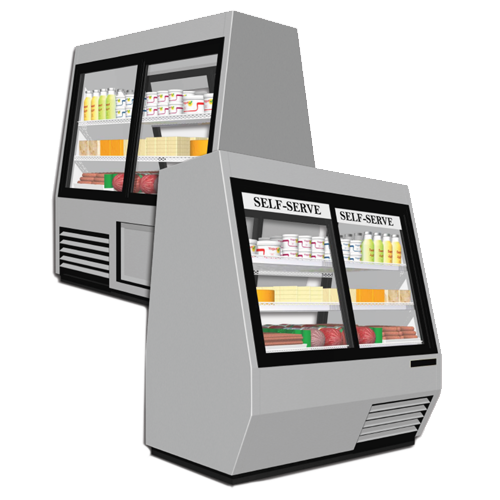 Thermoseal’s ClearCool® 3400/3500 Sliding Door Systems exceed the demanding requirements of a non-refrigerated deli or confectionary display case door with monolithic 5.0 mm glass versus an insulating glass unit. 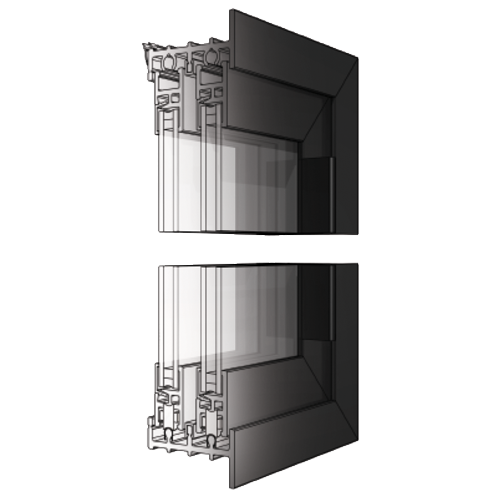 Available for flush-mount case applications, the ClearCool 3400/3500 Sliding Door Systems are manufactured with state-of-the-art low-conductivity PVC extrusion profiles for superior thermal performance. Low-thermal conductivity PVC extrusion profiles for superior thermal performance. Welded PVC corners provide additional strength and rigidity for long-lasting durability. Patent-Pending design reduces condensation and energy consumption. Field-replaceable wear components, including glass, hardware and gasket components. Hold-open option is available for self-closing doors. Multiple glass and solid panel configurations.